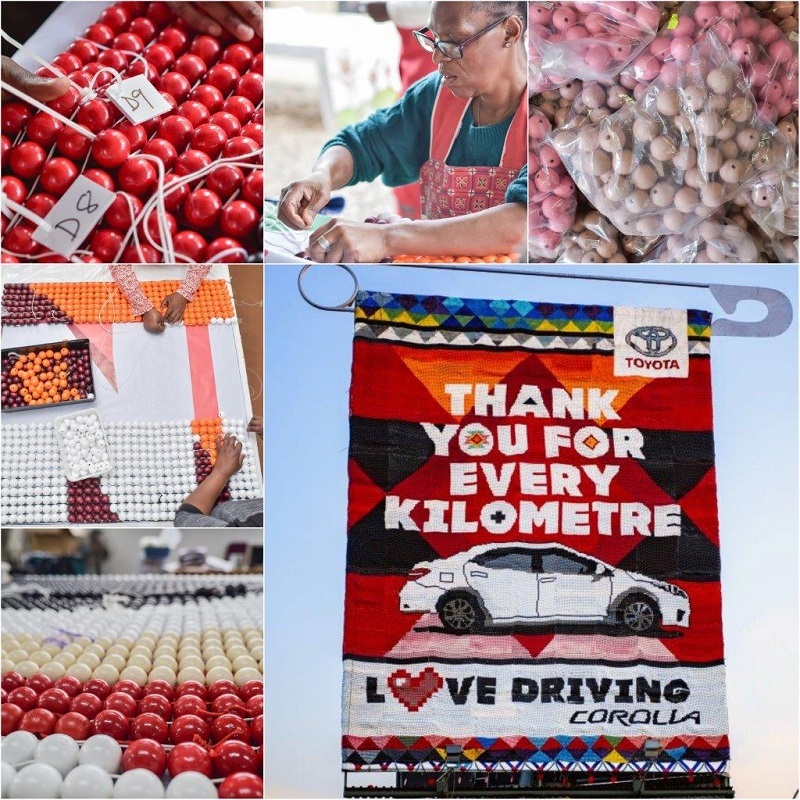 Toyota South Africa and its long-standing agency, FCB Joburg, have created a ‘beaded billboard’ with the help of KZN community-based NGO Woza Moya to celebrate the love Toyota Corolla owners feel every time they drive their cars and celebrate the Corolla heritage. Woza Moya (Come Spirit of Change in IsiZulu language) is the economic empowerment project of Hillcrest AIDS Centre Trust. 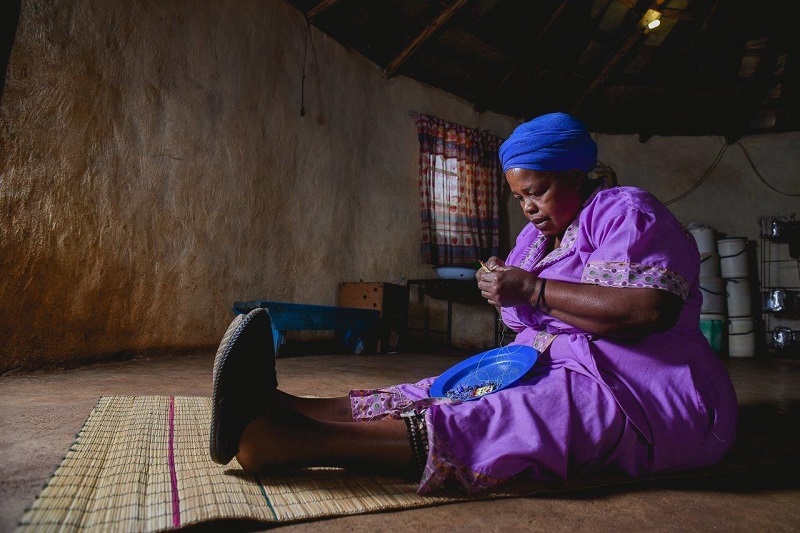 Woza Moya’s mission is to unearth creativity that creates economic empowerment through traditional quality local crafts made by people in need. Started in 2002 with five beaders making AIDS ribbons at a local church, the project now supports more than 350 crafters, most of whom have 5-10 dependents. Crafters were referred to Woza Moya by other HACT departments, including the respite unit, counselling department and home-based care project. Toyota SA wanted to celebrate the fact that Corolla has been the most-loved car in South Africa since ‘forever’ while entrenching its positioning ‘Love Driving’. The intricate workmanship in the Special Edition Corolla launched earlier this year was evocative of the uniquely South African visual language of Zulu love letters, so we used this for the art direction and design of the campaign. Our decision to create a love letter that was also a billboard came from the fact that this would have been a common feature alongside the roads the Corolla and Corolla driver would have traveled together. We absolutely love what we’ve achieved, and we’re thrilled that Toyota SA insisted the campaign include a large corporate social responsibility element. It has been an honor to work with the crafters from Woza Moya. 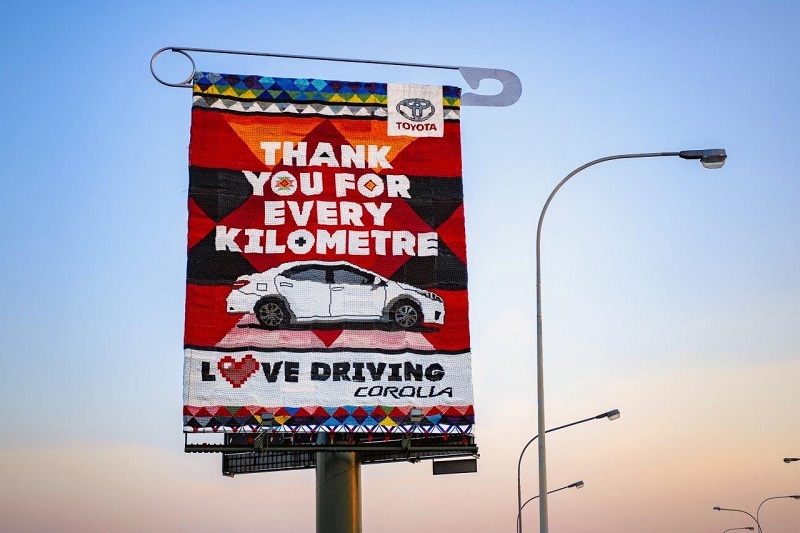 It was vitally important for us that this campaign, an act of thanks to Corolla drivers and their Corollas, also said ‘thank you’ to the community in which our Corollas are put together. Since 1975, the Corolla plant has been in KwaZulu-Natal, so the fit between Woza Moya and the campaign was ideal. We’re thrilled to have been able to create work for the crafters who belong to the initiative. 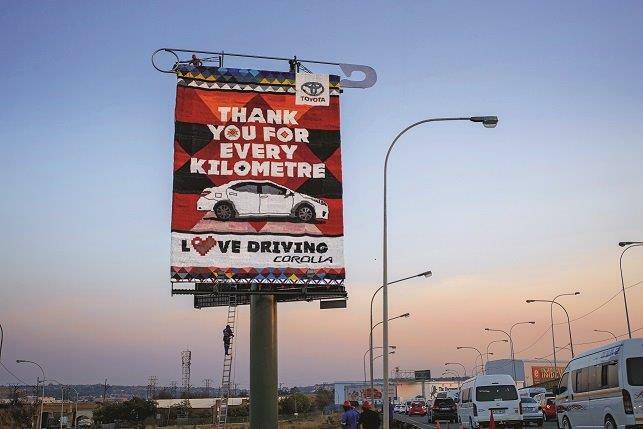 The Toyota Corolla Beaded Billboard, located alongside the M1-De Villiers Graaf (26°13’0.26”S 28°1’25.52”E), was unveiled on 15 September so that it ‘flights’ for a month around Heritage Day (24 September). The billboard and the social media campaign that will help spread the message and communicate the great work done by Woza Moya was devised by the FCB Joburg Creative Directors Tian van den Heever and Janine Kleinschmidt, Copywriters Esté de Beer and Marina Andreoli, and Art Directors Julie Thorogood and Thato Moatlhodi.